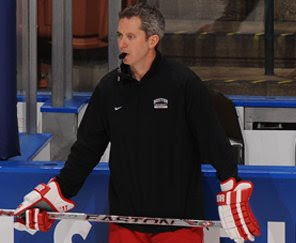 BU Hockey has a new Strength and Conditioning coach, succeeding Anthony Morando. 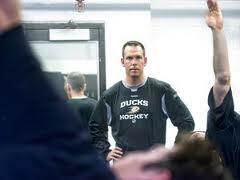 Sean Skahan is a Mike Boyle disciple (as is Morando) and spent the past 13 seasons as S&C coach for the Anaheim Ducks. While an undergrad at UMass-Boston, he interned at BU (under Glenn Harris) and at the Mike Boyle Strength & Conditioning facility (MBSC). He went on to become an assistant S&C coach at BC and at North Dakota. 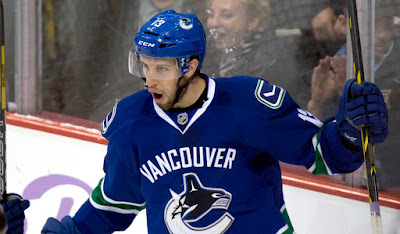 During his years with the Ducks, Sean worked with former BU standout Nick Bonino. ► Incoming freshman Jordan Greenway at Minnesota Wild development camp. 2018 recruit Jake Wise followed up Monday's five-point effort with two goals and two assists today to finish atop the scoring chart at the USA Hockey Select 15 development camp with 15 (6G, 9A) points. On Monday, he led Team Royal to a 7-5 win over Team Forest and today's 4-point performance spurred Royal past Navy, by an 11-2 count. The left-shot forward from North Andover, Mass., led Royal to a first-place finish in the tournament. He has points in all four games he’s played and his total is five more than any other skater. A left-shot center, Wise is expected to spend another season at Central Catholic High School where he scored 42 points (16G, 26A) in 25 games as a freshman. 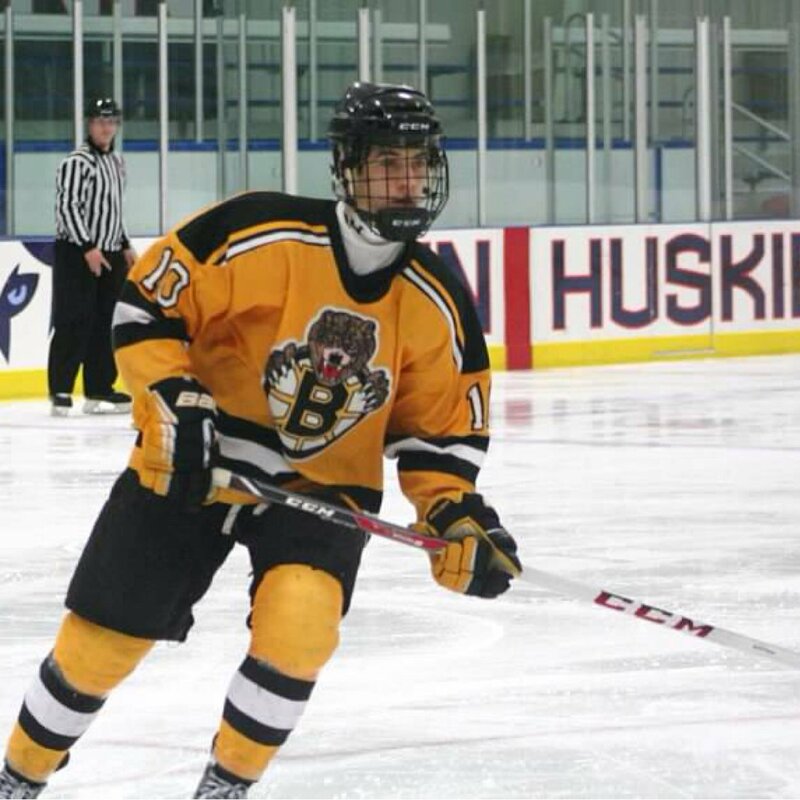 There have been reports that he's already been invited to join the NTDP U17s in 2016. 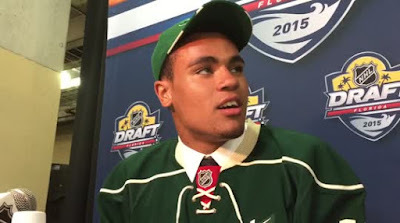 Jake Wise (BU) is good role model for how other top young prospects should play. While some coast through shifts, he brings it each shift. Wise's skill and physical tools are undeniable but his vision, hockey IQ and motor are off the charts. Really impressed me at Select 15s. Former Terrier forward and Associate Head Coach Mike Bavis has accepted a position as an assistant coach with the AHL Springfield Falcons under Ron Rolston. 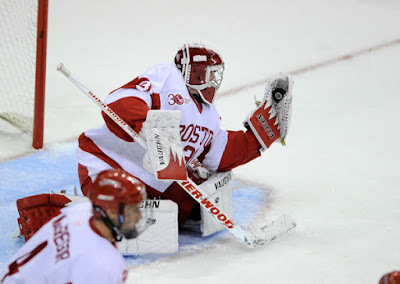 As a Terrier, Bavis played on four NCAA Tournament teams and three Beanpot Championship teams. His BU coaching career spanned 15 seasons, including four as Associate Head Coach. BU Today profiles "the unstoppable Marie-Philip Poulin, who led the Terriers to three Hockey East championships and powered Canada to the gold medal in the last two Winter Olympics. 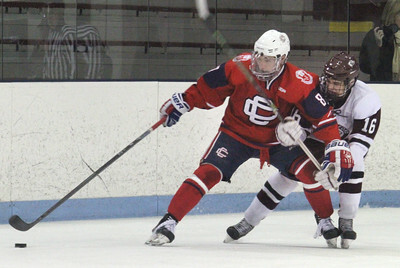 In her senior season, Poulin earned first team All-American honors and was a finalist for the Patty Kazamaier Award as the top college player. The Beauceville, Quebec, native, is considering coaching in the future, but first is taking aim on a third Olympic gold. The Penguins’ camp is being led by former BU captain, Bruins head coach, NY Rangers assistant coach, and newly named coach of AHL Wilkes Barre Scranton Mike Sullivan. He’s being assisted by former BU standout and U.S. Olympian Clark Donatelli, now in his fifth year at the helm of the ECHL Wheeling Nailers. At Bruins’ camp in Wilmington, Mass., former BU All-American and now Boston Bruins Development Coach Jay Pandolfo is putting the players, including Terrier sophomore Brien Diffley and freshman Jakob Forsbacka-Karlsson, through their paces. Saw some of the athleticism, skill, hands and coordination of Jakob Forsbacka-Karlsson on display during the tip drills in the forward session. He seemed to have the most ease redirecting point shots into the net with textbook tips while so many of his fellow forwards seemed to really have trouble with the very fundamental skill. Some of it may have just been fatigue, but some of the B’s prospects need to work on standing in front of the net and tipping pucks. It’s easy for me to say, of course, but still very true all the same. Sophomore goalie Connor LaCouvee completed his second NHL development camp today having skated with the Blackhawks after previously attending Rangers camp. "It was an interesting situation for him, last season, having three freshman defenceman there,’’ Flames general manager Brad Treliving told the Calgary Herald. “So he just kept getting more and more responsibility. The impressive thing is that the opportunity was there and Brandon didn’t sit back; he grabbed hold of it. “Now he’s going to become a leader on that team, develop in that area. What sticks out with him, obviously, is his skating. He’s an elite skater. It comes easy to him. For me, now, it’s just being a little more on the puck, working on his decision-making in that regard. ... We think the sky's the limit for this guy." ►One drafted Terrier not attending a development camp is Robbie Baillargeon. A 2012 Ottawa draft pick, he is attending the second summer session at BU and the NCAA prohibits a player from missing class to attend development camp. Baillargeon had participated in Senators' camp the previous three summers. Laser-focused on rebounding from a 2014-15 season that began with a bout of mono and never really got into gear, the right-shot center has been working out every weekday at BU as well as spending three days a week working on his shot with Glen Tucker (AKA Dr. Shot) at his Shoot to Score Academy. Alumni of the Waltham, Mass.-based program include Jack Eichel, Charlie Coyle, Noah Hanifin, Zdeno Chara, Jerome Iginla and John Taveres. When Baillargeon played in the Frozen Four this past April, he became the second family member to skate in the NCAA tournament. 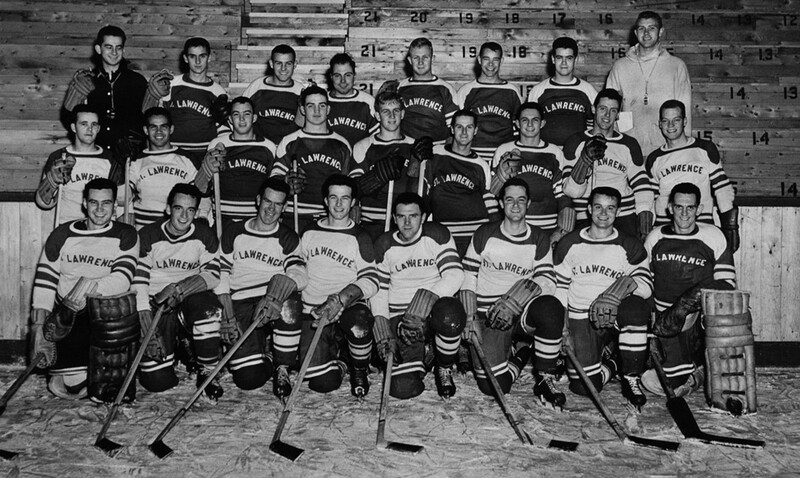 His grandfather, Gil Baillargeon (middle row, third from the right), played three seasons for St. Lawrence, including the Saints’ 1951-52 squad that played in the NCAA finals in Colorado Springs, losing to eventual champion Michigan in the semifinal. ►More video from last weekend’s Comm Ave Charity Classic featuring sharp goaltending by former Terrier Anthony Moccia. Former Terrier Corey Trivino is headed across the pond to play with Admiral Vladivostock in the KHL. 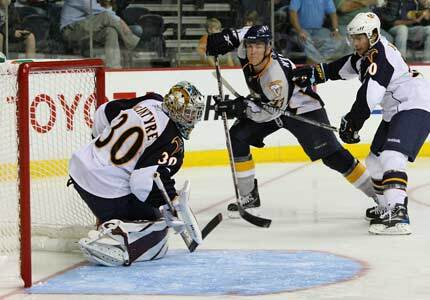 He skated for AHL Portland and ECHL Florida last season. Senior Sarah Lefort and sophomores Victoria Bach and Rebecca Leslie received invitations to Canada’s National Women’s Development Team selection camp in Calgary beginning August 6.